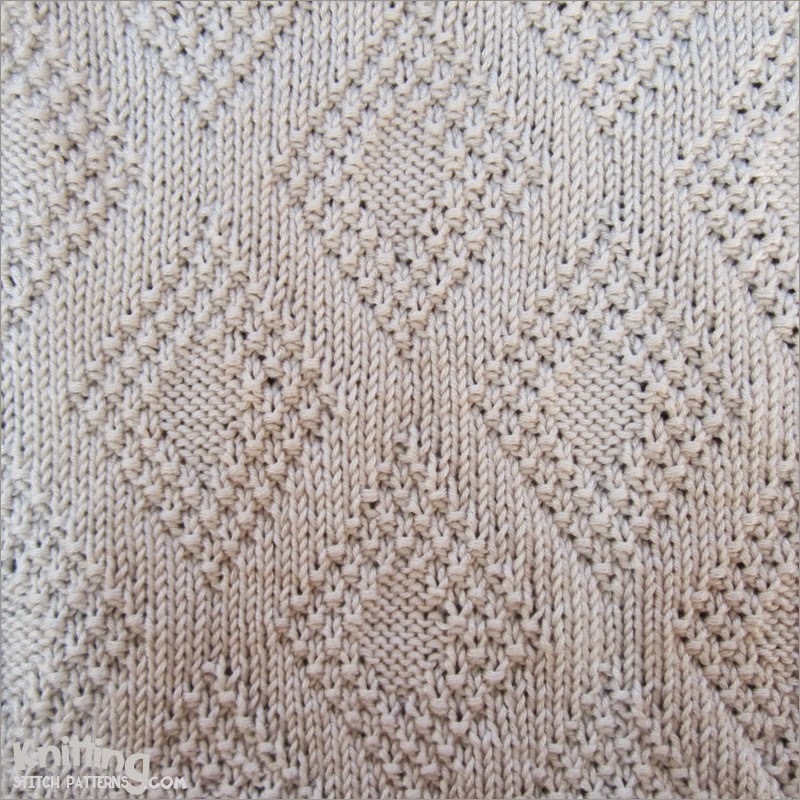 Knitted in a multiple of 22 sts + 1 and a 36-row repeat. Row 1: P1, * p4, (k1, p1) twice, k5, (p1, k1) twice, p5; repeat from* to end. Row 2 and all wrong side rows: Knit the knit stitches and purl the purl stitches. Row 3: K1, * p5, (k1, p1) twice, k3, (p1, k1) twice, p5, k1; repeat from* to end. Row 5: P1, * k1, p5, (k1, p1) 5 times, p4, k1, p1; repeat from* to end. Row 7: K1, * p1, k1, p5, (k1, p1) 4 times, p4, k1, p1, k1; repeat from* to end. Row 9: P1, * (k1, p1) twice, p4, (k1, p1) 3 times, p4, (k1, p1) twice; repeat from* to end. Row 11: K1, * (p1, k1) twice, p5, (k1, p1) twice, p4, (k1, p1) twice, k1; repeat from* to end. Row 13: K1, * (k1, p1) 3 times, p4, k1, p5, (k1, p1) twice, k2; repeat from* to end. Row 15: K1, * k2, (p1, k1) twice, p9, (k1, p1) twice, k3; repeat from* to end. Row 17: K1, * k3, (p1, k1) twice, p7, (k1, p1) twice, k4; repeat from* to end. Row 19: K1, * k2, (p1, k1) twice, p9, (k1, p1) twice, k3; repeat from* to end. Row 21: K1, * (k1, p1) 3 times, p4, k1, p5, (k1, p1) twice, k2; repeat from* to end. Row 23: K1, * (p1, k1) twice, p5, (k1, p1) twice, p4, (k1, p1) twice, k1; repeat from* to end. Row 25: P1, * (k1, p1) twice, p4, (k1, p1) 3 times, p4, (k1, p1) twice; repeat from* to end. Row 27: K1, * p1, k1, p5, (k1, p1) 4 times, p4, k1, p1, k1; repeat from* to end. Row 29: P1, * k1, p5, (k1, p1) 5 times, p4, k1, p1; repeat from* to end. Row 31: K1, * p5, (k1, p1) twice, k3, (p1, k1) twice, p5, k1; repeat from* to end. Row 33: P1, * p4, (k1, p1) twice, k5, (p1, k1) twice, p5; repeat from* to end. Row 35: P1, * p3, (k1, p1) twice, k7, (p1, k1) twice, p4; repeat from* to end. 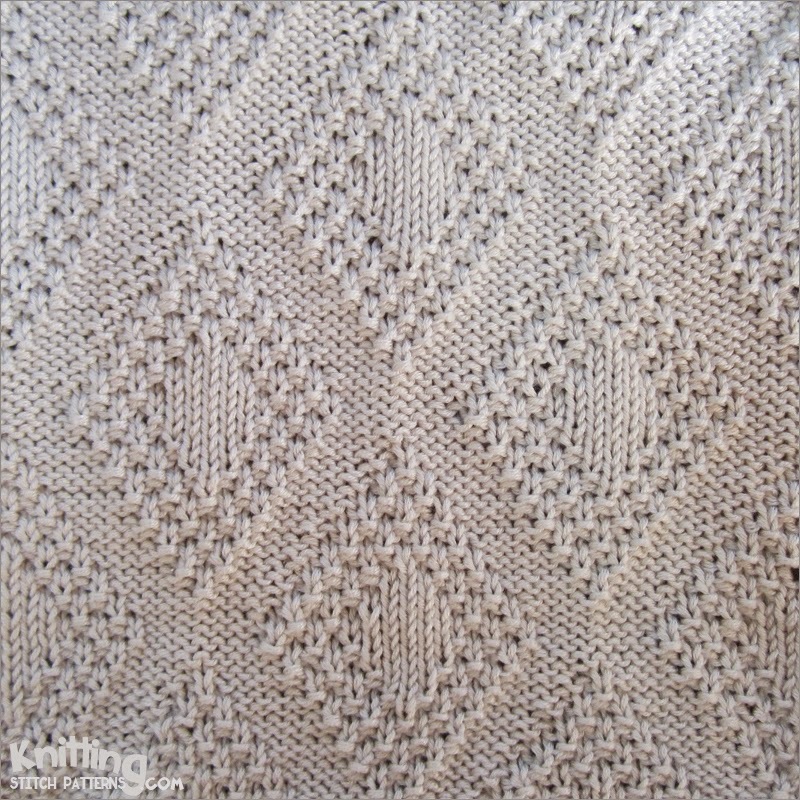 Row 36: Knit all knit stitches and purl all purl stitches.